The main feature of this plan is the internal commercial pedestrian spine. This linear connecting element was carefully crafted in terms of scale and urban space quality. The main spine is intersected by 2 paths taken as an extension of adjacent streets to ensure easier flow of public into our project. The intersection zones are turned into pedestrian Plazas of diverse character. These Plazas were featured with micro scale urban architectural elements in the facades and on ground for enrich the quality of the urban experience of this winning scheme. This design includes carefully located urban landmarks to insure visual continuity and integrity of the urban space. This can be seen in delicate location of the mosque’s minaret as an example. 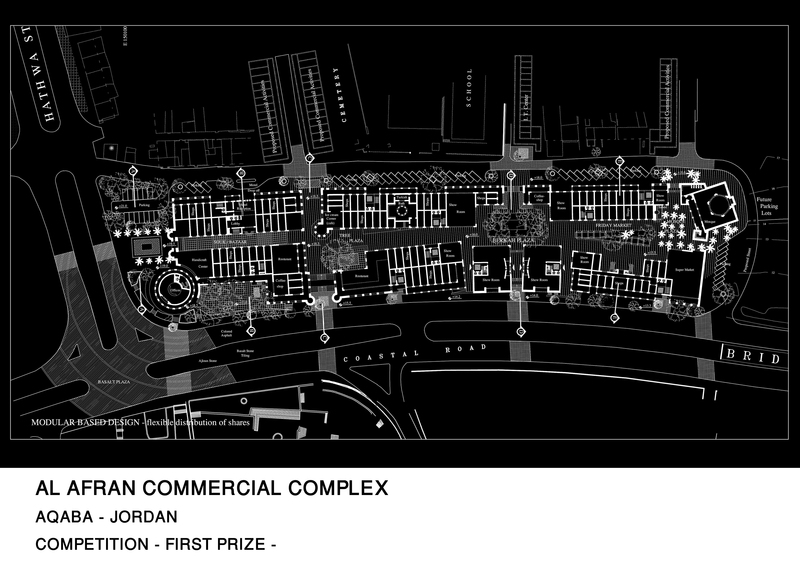 It important to mention that the Aqaba Authorities adopted this project’s scheme as a building regulation for further development of this site.The main feature of this plan is the internal commercial pedestrian spine. This linear connecting element was carefully crafted in terms of scale and urban space quality. The main spine is intersected by 2 paths taken as an extension of adjacent streets to ensure easier flow of public into our project. The intersection zones are turned into pedestrian Plazas of diverse character. These Plazas were featured with micro scale urban architectural elements in the facades and on ground for enrich the quality of the urban experience of this winning scheme. This design includes carefully located urban landmarks to insure visual continuity and integrity of the urban space. This can be seen in delicate location of the mosque’s minaret as an example. It important to mention that the Aqaba Authorities adopted this project’s scheme as a building regulation for further development of this site.